I worked with Japanese students in Boston a few years ago, and I found them to be some of the kindest, sweetest people I’ve ever met. Further, I was in Japan briefly a few years ago, and saw a hard-working people, driven for success and achievement. They’ve really set an example for the world in pursuing excellence and innovation. That said, I am deeply affected and grieved at the disaster that has decimated their country. I felt impressed to take a blog and try to deal with the tough topic of what’s going on in Japan in light of God’s sovereignty. It’s not tough because the Bible isn’t clear on it, but it’s tough because most people struggle with what the Bible has to say, especially western Christians. We’ve been force-fed the “God as Santa Claus” doctrine so much that it’s difficult for most Christians to see any other parts of His nature. I hope this blog will provoke the reader to faith and faithful consideration of His Word. First of all, what is happening is horrifying and immensely sad. 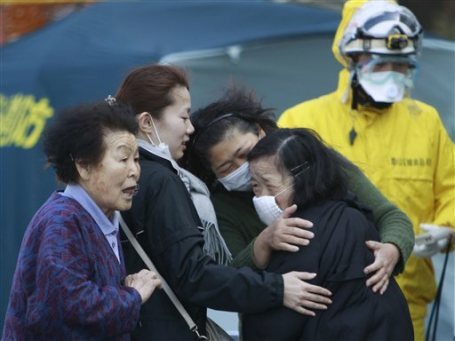 It’s painful to look at the images coming from Japan and to hear the reports of unthinkable suffering. I am praying for strength for the people, and that the Church (in Japan and worldwide) would be wise, compassionate, and strong in such an hour. Second, we must all respond with compassion and share in their grief. In no way do I intend that this blog would be seen as inconsiderate, uncaring, or cold-hearted toward the very real pain that many Japanese are enduring right now. I simply want to frame this tragedy for all readers with faith, and encourage biblical thinking. The whole ordeal raises some serious and searching questions: Did God cause the natural disasters? Why does God allow suffering? Is this God’s judgment on Japan? If God had the power to stop it, why didn’t He? In answering these questions, we have to be careful to see what the Bible says about all this. There’s a real temptation to deal with the questions emotionally, or through carnal reasoning try to provide answers the Bible simply does not give. We also must remember that anything the Bible teaches is for our benefit, to deepen our worship, our trust, and our comfort. All this in mind, here’s what the Bible has to say. What happened in Japan was not a series of random chance circumstances that happened to victimize the unfortunate Japanese people. In the truest sense of the phrase, it was “an act of God.” He is the “first cause,” though it was secondary agents (shifting continental plates, earthquakes, tsunami) that brought about His will. Jonah is thrown overboard by the mariners after he refuses to go to Ninevah and the Lord sends a storm. Then Jonah is swallowed whole by a big fish. In the belly of the whale, he says to God, “For you cast me into the deep, into the heart of the seas, and the flood surrounded me; all your waves and your billows passed over me” (Jonah 2:3, emphasis mine). Interesting that just a few verses before, the Bible is clear that it was the mariners that threw Jonah overboard. But now Jonah looks beyond them, and sees the hand of God. This gave him comfort. It was Joseph’s brothers that were sinfully jealous of him (Genesis 37:11), hated him (Genesis 37:4,5,8), sought to kill him (Genesis 37:20), and wickedly cast him into a pit (Genesis 37:4) and then sold him into slavery (Genesis 37:28). Yet, in the end, when his brothers came and begged for forgiveness, Joseph looks beyond all their evil, and sees God when he says, “And God sent me before you to preserve for you a remnant on earth, and to keep alive for you many survivors” (Genesis 45:7, emphasis mine). Later on, he says, “As for you, you meant evil against me, but God meant it for good, to bring it about that many people should be kept alive, as they are today” (Genesis 50:20, emphasis mine). Joseph could see the hand of God as He looked at the worst pain in his life. We need to pray that the Japanese will look beyond all their pain and see the hand of God drawing them to Himself in the midst of the suffering. We are not home yet. Colossians 3:2 says, “Set your minds on things that are above, not on things that are on earth.” God uses our suffering and trials to take our eyes off of things that are not valuable. This life we are in is transient. It is the mercy of God to wake us up from our soul slumber so that we cease valuing temporal things. I’m sure that as many Japanese people watched their homes washed away or their loved ones die, they began to think about what life is really about. I’ve already heard of many hearts turning to God and pondering eternal things. The famous verse Romans 8:28 says, “And we know that for those who love God all things work together for good, for those who are called according to his purpose” (Romans 8:28). This tragedy in Japan can turn into a great blessing for their nation if they will open their hearts to the gospel. Whenever we see this kind of gross suffering, it’s a test for the rest of the world. God has compassion, and wants us to be like Him. Will we simply shake our heads and turn on the ballgame, or “weep with those who weep” in prayer? Will we share our goods with the poor? Will we go and bring the hope of the gospel to them? After World War II, the Japanese knew they were defeated, and cried out for missionaries to come to teach them about Jesus. The western church failed miserably and few answered the call. As a result, Japan became one of the most godless nations in the world. The church has another opportunity now to respond with compassion, and show them the love of God and the hope of the gospel. Habbakkuk 2:14 says, “For the earth will be filled with the knowledge of the glory of the LORD as the waters cover the sea.” The end of all things is the glory of God. But the glory of God is not merely for God’s ego, but His glory and our good soar together. As John Piper famously said, “God is most glorified in us when we are most satisfied in Him.” Therefore, it would be cruel of God to allow a nation to continue in ignorance of His love, His reality, and His glory. It may be that in His sovereign plan, He will turn the events in Japan to result in His glory among the Japanese people. Let’s pray that it will be so. Further, let’s pray that the church in Japan will be strong and wise. As for you and me, let’s rest in the sovereignty of God, and not allow our confidence to be stolen, that He was, and is, and shall be for all days, the King over His creation. Thanks Derek for another great blog. I’m reminded of what I was taught years and years ago.. In high school, which always helped me look at God’s perspective of ‘natural’ disasters. ( and how God is the first cause) When He first created the world he aslo created ‘natural’ law. Like the laws of physics. Two continental plates under pressure, shift = earthquake= tsunami. It’s absolutely sad and ridiculous for people to ‘blame’ God for somehow not paying attention, saying he didn’t love those people or to say that these disasters were the punishment he meted out. It rains on everyone!